The California Department of Fish and Game and Dr. Eric Loft of the DFG have been very important sources of information both in written and interview form for Keith Smith. The following factors, operating singularly in some areas and in combination elsewhere, resulted in a drastic decrease in deer numbers during the second half of the nineteenth century. Probably unregulated hunting was the most widespread influence, but locally overgrazing, snowy winters and/or agricultural or urban development may have been just as important. 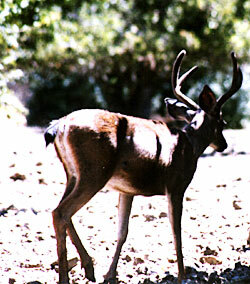 In any event, by 1900 and for a decade or more thereafter, deer were scarce over most of California. At this time the conservation movement was born and the downward trend in the deer population was stabilized and reversed. With the expansion of the white settlements, pioneers headed west. Between 1850 and 1860, the Indian population was inundated by the rush of settlers and the available land was quickly taken up. Most men carried a rifle. Wild animals, including deer were shot year around. At first deer were abundant, but continued killing soon reduced their number to a point where they were seldom seen. As black-tailed deer became scarce around the settled areas, sportsmen and market hunters had to move back into the more remote areas where hunting pressure was light in order to find them. The market hunters killed black-tailed deer for their hides alone at first, and later for their meat, which was made into jerky. There are still traces of old jerky camps in the hills, such as Skeleton Glade in the Mendocino National Forest which was named for the pile of deer bones left there when the meat was cut off and laid to dry on racks. Following the discovery of gold in 1848, California experienced a rapid and violent change. Gold hunters by the thousands spread over the northern half of the State, and their activities affected the black-tailed deer in many ways. The number of persons involved in the Gold Rush was astonishing. In 1852, it was said that there were occupants on every gravel bar of the Trinity River from Salyer to Carville. During the late 1850s there were allegedly more people in the Trinity, Klamath, and Scott River areas than there have been at any time since. The same congestion was experienced in the Mother Lode region of the Sierra Nevada and locally on the east slope of the Sierra. The miners shot deer year round for meat and hides. They altered the deer range by logging, burning, grazing, and clearing. Some of these changes ultimately benefited the deer but the immediate impact of settlement led to a sharp decrease in deer numbers. The accounts of meat hunting by miners are dramatic. It was natural, of course, that the settlers should make use of game since meat was in demand and domestic stock was scarce or absent in the gold areas. In fact, game brought such high prices that many miners abandoned mining to make a good living hunting. The immediate effect of such unregulated hunting was a rapid decease of deer in many locations. From 1850 until about 1903, commercial deer hunting camps and scattered individual market hunters operated here and there throughout the state. Some of these operations were astonishing in their magnitude. In 1924, Thus Hunter relates that a single firm in Redding, California shipped 35,000 deer hides in the 1880s. A retired Fish and Game patrol captain said that one hunter had killed over 300 deer in the Mineral King area in the 1880s. Another hunter marketed 120 deer in 1873, all taken from a winter range along the Kaweah River. Another game warden knew of a hunter killing 93 deer in the Lava Beds area of Modoc County in 1903. According to the United States Forest Service, in Riverside County, deer were killed by the "wagon load" in the Santa Ana Mountains around the turn of the century. Similar examples can be quoted from around the state at that time. At the turn of the century overhunting was one of the biggest contributing factors in the decline of the black-tailed deer population. Following the Gold Rush, a flood of domestic livestock spread over California. At first the demand for meat exhausted the existing Spanish herds. In 1850, only 17,514 head of sheep were reported to be in California, compared with an estimated 2 million in 1825. Subsequently, great numbers of livestock were imported from states to the east. Between 1852 and 1857, for example, 551,000 sheep were driven from New Mexico to California. Large herds of cattle arrived from Texas and Mexico. Livestock spread far beyond the boundaries of Spanish California. They reached the north coast area in the 1850s, and also came into Lassen County at this time. The first great trail herds of sheep began their circular sweeps through the Sierra in the 1860s. By 1876, there were 6 million head of sheep in California and equally impressive numbers of cattle and horses. For a time the unexploited grasslands and meadows supported these animals adequately, but as the ranges became overgrazed, carrying capacity for both livestock and for deer decreased rapidly. In 1873, John Muir wrote: "It is impossible to conceive of a devastation more universal than is produced among the plants of the Sierra by sheep. Clarks Meadow is fast changing from wet carex to a sandy flat with sloping sides. The grass is eaten close, and trodden until it resembles a corral, although the toughness of the sod preserves the roots from destruction. But where the soil is not preserved by a strong, elastic sod, it is cut up and beaten to loose dust, and every herbaceous plant is killed. Trees and bushes escape. Nine-tenths of the whole surface of the Sierra has been swept by the scourge." In addition to unregulated hunting and livestock competition, deer suffered some of the hardest winters in California history between 1879 and 1907. For example, in 1879-80, 65 feet of snow fell in areas of Nevada County, and in 1889-90 this record was nearly equaled. The winter of 1906-07 set an all-time record in the high mountains when over 73 feet of snow was recorded at Tamarack in Alpine County. For overall effects, the winter of 1889-90 was probably the most severe for which records are available. In what are now deer winter ranges, the following snowfalls were recorded: Nevada County, over 32 feet; Mount Shasta City, over 22 feet; Susanville, nearly 17 feet; Placer County, over 49 feet. It is apparent from these reports that many of the winter ranges used at the present time must have been unavailable to deer during periods of such severe winters. In the northern part of the state the effects of hard winter, starting in 1879-80 and reoccurring during the next decades, may have been sufficient in themselves to account for the scarcity of deer following the turn of the century. Since that era, a distinct trend has developed toward milder winters and drier summers, which may have contributed to the restoration of deer in many parts of northern California. Large-scale logging commenced with the Gold Rush and spread rapidly over the forested areas of the state. In the redwoods of the Santa Cruz Mountains the peak of logging was in 1875. Around Lake Tahoe the period of most intensive logging was the 1860ss and 1870s when lumber was being shipped to the mines at Virginia City, Nevada. In fact, the Tahoe area was the largest lumber-producing center in the state in 1875. The complete lack of control and the prevalence of logging fires made the early period of lumbering from the 1850s to 1890s far more destructive to the forest than anytime since. By 1892, when the first national forest was established, most of the timber areas of California were in process of exploitation, and huge areas had been slashed and burned. The immediate effect of this disruption of the natural vegetation and of the presence of logging crews in the woods doubtless affected the deer adversely. In later years, however, the clearing developed into brush fields that supported many more deer than the original forest. Hence the process of timber clearing, while it might have been enormously destructive to resources as a whole, was only temporarily destructive to the welfare of deer. More significantly has been the permanent conversion of wildland to agricultural and urban development. From 1849 until the present day, the area of potential deer range has been steadily shrinking, more or less in proportion to the increase in humans. The program of deer management that evolved between 1907 and 1930 was designed primarily to restore breeding stock, which was so badly depleted at the turn of the century. Legal protection was the backbone of the program, but refuges, parks, predator control, and better forest management (including grazing regulations) were also of importance. Likewise the shift in weather, toward more moderate winters, was a factor allowing for a dramatic increase of deer in Northern California and in mountainous areas. The response of the deer population was immediate and spectacular in some areas, irregular and spotty in others; but the overall trend had been upward nearly everywhere. The following events support the increase in the deer population. As early as 1916, the unprecedented snowstorms in the northern mountains and extreme conditions demonstrated that deer were much more numerous in Northern California than was believed. Reports from deputies tell of large bands of deer seen in El Dorado, Shasta, Lassen, Modoc, and Siskiyou counties. They tell of bands of deer being fed by cattlemen and farmers. The California and Oregon Power Company at Copco on the Klamath River fed 300 deer, E. H. Ober fed 800 deer in the Owens Valley, L. J. Warren of Plumas County observed 126 deer daily. 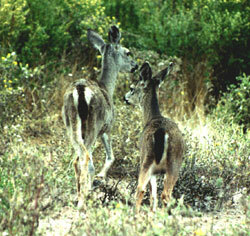 A game warden in Adelaida near Paso Robles, California, said between 1895 and 1905 he saw only two deer. Later he reported seeing 200 deer a day in the same area. The accounts go on and on. By 1922, deer were numerous in the Mendocino National Forest and a census of the feeding grounds revealed a population of nearly 40,000. In 1925, Yosemite National Park estimated the number of deer in the park at 30,000. Deer were found to be abundant in the Mammoth region as well. In most areas of the state the deer continued to increase from the 1920s at least until the period of 1939-41. Since then, there probably has been no overall growth of the population. It would appear that by 1940 the better deer ranges in California were fully stocked, and in many cases overstocked. Since then there have been local ups and downs in deer number but the aggregate population in the state probably has remained more or less the same. In short, the restoration of breeding stock, up to the limits the range would support, was pretty well accomplished. Once the ranges were stocked with deer, a new set of management problems cropped up. Reports of agricultural damage by deer increased markedly after 1930. Likewise, cases of deer damage to range were reported with increasing frequency. 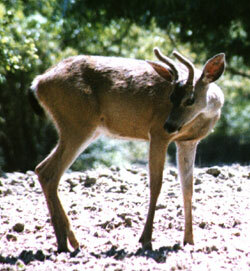 Periodic die-offs of deer on densely populated ranges became commonplace, some caused by parasites or disease; other by outright starvation, but all manifestations of local overpopulation. California was a pioneer state in wildlife conservation legislation. As early as 1852, deer were given legislative protection during six months of the year. In 1883, a buck law was put into effect, giving legal protection from hunting does and fawns. In 1893 the season was reduced to six weeks and in 1901 there was the first bag limit, namely, three bucks, and the sale of meat and hide was prohibited. Four years later the bag limit was reduced to two bucks. But there were few regular wardens and the regulations were virtually ignored. It was not until the first hunting license was required in 1907 that a source of funds was available for hiring full-time game wardens. Further limitations on hunting were adopted in 1919, and spike bucks were declared to be illegal. This measure was intended to preserve as breeding stock the yearling class of deer. The gradual restriction of deer hunting privileges, coupled with increasingly effective enforcement, contributed importantly to the increase of deer first noticed during 1910-1920. People began to pay more attention to the game laws, and the deer began to increase throughout its range, especially around cultivated lands. It should be remembered that deer were practically eliminated around the edges of cultivation by heavy hunting pressure. Their range was not destroyed, in fact, it was improved by clearing and the planting of crops. As soon as the hunting pressure relaxed, the deer population began to rebuild. Deer have been on a slight decline since the 1960s, most likely due to the habitat condition. The condition of the habitat has also been on a decline since the 1930s, due to fire suppression, which reduces the value of the habitat to deer. Without fires the habitat becomes old or decadent, and unable to support the wildlife populations of the past. Other factors that have affected the decline is the increasing competition with livestock and overuse of the ranges by the deer themselves. The greatest declines have occurred in northeastern California and the Northern and Central Sierra Nevada. Conversely, deer populations along the western half of the state have remained stable to slightly increasing.